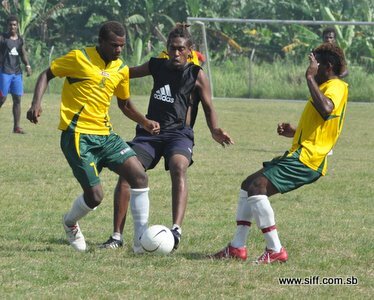 A opening ceremony for corporate guests and club officials will take place this Friday at the Solomon Islands Football Federation (SIFF) headquarters which features speeches, the unveiling of the official Telekom S-League logo and the official declaration of the commencement of what will be SIFF’s biggest event in its annual calendar. The formal opening ceremony is followed by an inauguration match between the Solomon Islands national U-20 squad and a combined national futsal and beach soccer team the next day at Lawson Tama. Preparations for the launch are well underway and the recent bad weather in the country has not dampened the anticipation that both programs will be completed without interruption. SIFF media officer, Joseph Boso, confirms today that SIFF is proceeding as planned to ensure that the launching takes place this weekend so that the kick off date of February 12 is maintained. “At this stage we are sticking with our schedule and have sought advice from responsible authorities who have indicated that the weather will be fine so this is good news for us. However, in the interest of safety we shall continue our communication with the weather bureau and heed any warnings that they issue,” Boso says. SIFF has spent the most of January preparing for the launching of the S-League and is working with major corporate partner DJ Graphics through its subsidiary Impact Sports Marketing to organise program for Friday and Saturday. The competition matches are fixtured to start 1 week after the opening ceremony and are expected to be completed at the end of May after a total of 56 are played in the league competition and an additional 12 in the championship. Local telecommunications company, Our Telekom, is the major sponsor of the Telekom S-League.